Between all the Stevias, Truvias, Splendas, and Sun Crystals, it’s hard to find a good sugar to use these days. Having tried most of these I was still disappointed. All I wanted was some pure sugar cane! How hard could that be to find?! While I did finally find what I was looking for, first I’d like to explain why I didn’t care for the other products. Stevia, which is basically a plant that grows sweet leaves, seems healthy and organic enough, however most of it comes from South America, Mexico, California, and Florida costing way too much fossil fuel and biodiesel to reach my home. It is possible to grow Stevia in your home, however unless you live in the above mentioned areas you will need grow lights to survive the colder months. 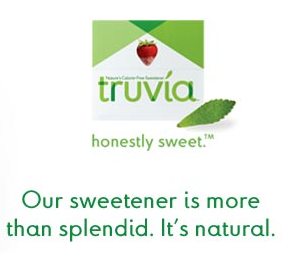 Truvia is a similar product taking its sweetness from the earth, but grown in another country and manufactured and packaged in Minnesota. Additionally, they state on their website that the leaves used in making this product are not organically grown. Remember, “natural” DOES NOT mean “organic”. It’s the marketing executive’s way of manipulating you. OK so on to Splenda. I used this product for several years starting when it first came out. I got used to the taste of it quickly and was intrigued with its 0 calories. This product is made in a lab by combining a sugar molecule with chlorine. Since our bodies cannot digest chlorine the molecule passes through our bodies without contributing any calories. While the chlorine is bound to the sugar its left me wondering ‘What happens if it becomes un-bound?’ Chlorine is a carcinogen afterall, but I guess these days what isn’t? Oh yeah now I remember, it’s all that fresh produce organically grown. That’s not carcinogenic. Sun Crystals is another product I’ve recently seen popping up in my local supermarket. I bought a small box of it once when I was on my hunt for the perfect sugar and it tasted alright. Each packet has only 5 calories. It also came in a 100% recycled box and boasted messages of environmental awareness all over it, which I thought was nice. Sun Crystals is a blend of both stevia and cane sugar. Again it says it’s “natural” but I was unable to confirm it was organic. This product is produced by the same Company as Splenda, which is located in Pennsylvania. I also couldn’t find any information on where the plants were grown or processed. Finally I found the product I was looking for: organic pure cane sugar from Woodstock Farms in Dayville, CT. It’s deliciously sweet, only 15 calories per teaspoon, organic, local, and comes from a farm I trust. Entry filed under: Products. Tags: Connecticut, Organic, Sugar, Woodstock Farms.